Otherwise do take a look below to find more about my big heaps... vv A large timber bin is always a garden asset for making more. It’s over 15 years and a couple of moves since I first acquired my timber modular compost bin. Time for a new one I think and here it is. 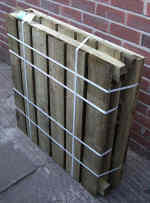 Neat Timber Composter Kit U.K.
Read more on Timber Bins below. Please note that typical slot-together slatted timber bins have to be deconstructed to empty them. After assembly is complete, if you choose a model like mine with solid sides and door hinges, then I recommend applying vaseline or oil to the hinges. Otherwise - after a few years outdoors - corrosion causes the hinges to stick, so then it may snap it off when forced. Before assembly, I painted the wood sections with preserve to match the shed color. I cleared a level site that was rather shaded and so less productive. My new bin is now neatly aligned with my garden shed and garden path for easy access. Rectangular shaped bins win over round containers for storing bulk compost space efficiently. But I've planted 3 Comfrey plants around the outside. Then I made simple assembly many times more complicated. Bricks are not needed to level the site or steady the structure once filled. Unless your site is actually waterlogged there's no need to worry about wet. My under floor aeration channel was also unnecessary. The polymer lid retains heat and moisture while keeping out excess rain. Fastening holes hook over 3 screws. These are perhaps best located in winter when the wood has expanded in the moist air. 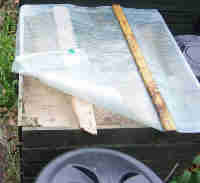 After hooking the lid shut I slid in a light timber bar to prevent the rain pool sagging the cover. I also cover the surface of the material inside with an additional plastic sheet and old carpet. Early summer is a good time to make a hot heap from all your greens:– waste spring cabbage, winter lettuce and rhubarb leaves; waste sprouts, surplus green manure plants, lush grass cuttings and saved autumn fall leaves, soft prunings, dead or surplus flower plants and spring pulled weeds all piled together. - You could add some comfrey or nettle leaves, and a sprinkling of chicken manure if short on greens. These make a splendid hot heap that may be ready to dig in by autumn. Check out the large Timber Bins with these links. However, a cold brown heap made from late summer to late autumn and left over winter also makes very good stuff. You can use:- shredded hedge cuttings and fall leaves, grass cuttings, fruit drops; waste greens, tomato, cucumber, bean and plants, uninfected potato haulms, weeds and loads of other stuff to make compost from late summer over autumn and winter. You’ll probably find it all finished by spring and it produces lovely stuff. What I find often happens if you haven’t got enough waste material, is that a smaller warm heap cools down. You keep adding stuff before sealing up for winter. Then the worms get into it and by spring it has turned into lovely garden compost. The pre-treated wood was guaranteed for 10 years - that was over 15 years ago. I didn't add anything extra. But now it's about time for a new one I think. 37" x 37" x 35" high gives a larger capacity of 27 cu ft. For the gardener who has a garden to play with. A larger volume takes all you've got and heats up well. There is plenty of aeration so you should keep the heap covered. If you're considering the worth of larger bins but haven't quite got enough garden waste it may be worth asking your friends and neighbhours for their garden waste. Modules allow one heap to cook while the other is being made. It is often sensible to have 2 or 3 bins. One bin is used to collect material. (Having seperate piles for green, and woody etc... is useful) Then make your compost heap in the 2nd bin, while a 3rd bin is waiting to be emptied. The above easy to assemble modules are available as single bins, as an add-on unit, or you save when you start with 2 modules. 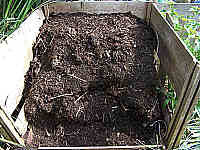 Find Large Compost Bins, Build Modules Easily From Kits.